CD review: "Hey, Where's Your Brother?" 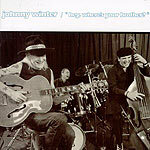 White bluesman Johnny Winter has finally, with Virgin Records' Pointblank blues subsidiary, found the best of all possible worlds: He's on a major label, and he's allowed to play the blues. For too long, Winter was forced into the role of white rock guitar slinger for Columbia Records, before Bruce Iglauer and Alligator Records gave him his artistic freedom. Still, Alligator is a medium-sized independent, without the resources a major label (Virgin is owned by Capital/EMI) can bring. This album is his finest in many years, and reunites Winter with his brother, Edgar Winter, on vocals, organ and saxophone. It's a straight-ahead blues set, with a special seasonal treat being a cover of Charles Brown's "Please Come Home for Christmas."